We have developed a series of FAQs that we believe will help users of the site come up to speed faster. Some of them are self-explanatory while others are explained with appropriate screen shots from the web site’s PDF Search page. (1) Why am I unable to access the web site or am unable to see it fully? Be certain that your Browser is up-to-date and that you have JAVA and cookies turned on. For PCs the most up-to-date Internet Explorer is best while for Apple computers Safari is necessary. (2) Do I need to register? No. Is there any requirement needed if I am to use the site? No. The web site is freely accessible to all. To access the site just start a search. (3) There appear to be three sections defined on the PDF Search page. What do the three sections basically do? Figure 1 is a screen shot from the PDF Search page of the web site. Each section is a filter that defines and narrows your search for you. 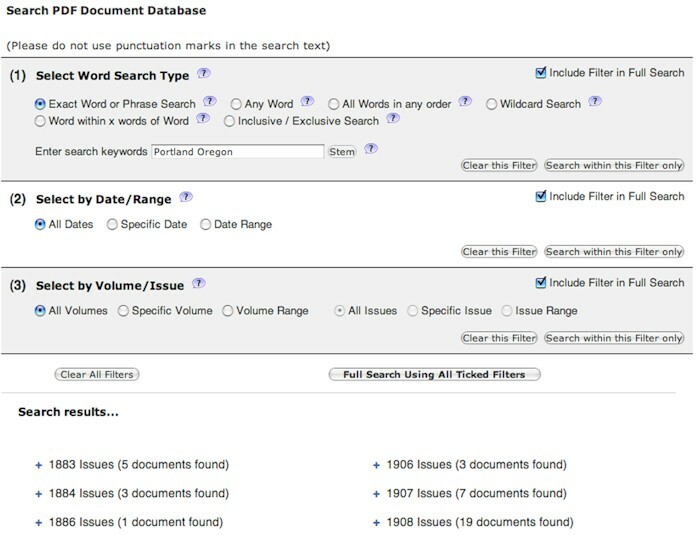 Filter (1) “Select Word Search Type” defines the actual text (word or phrase or name) for which you are going to search. Filter (2) “Select By Date/Range” can limit the search to all dates, a range of dates or a specific date. Filter (3) Select By Volume/Issue” limits the search in a different manner. 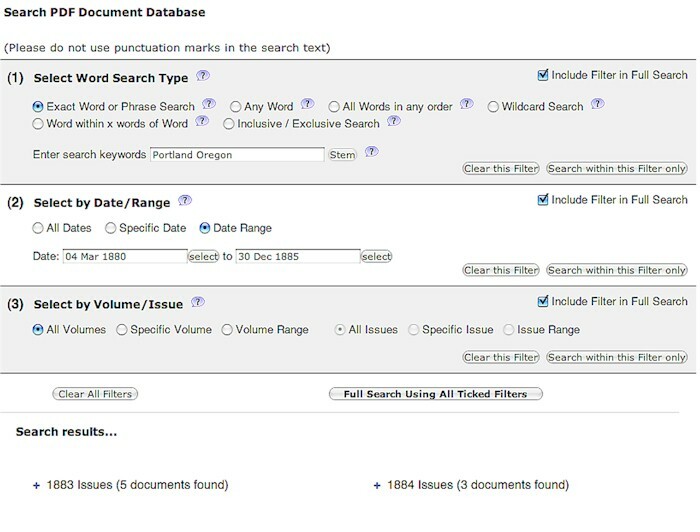 If you use it, it can narrow the search to specific volumes (ie, years) or issues. (4) How do I do a search of all the issues in the database (ie, from 1880 to 1971)? (a) First, in the first filter click on the ? marks and read the associated explanation about how each of the six search functions works. Each of them allows a search for some text, using one of the six techniques. 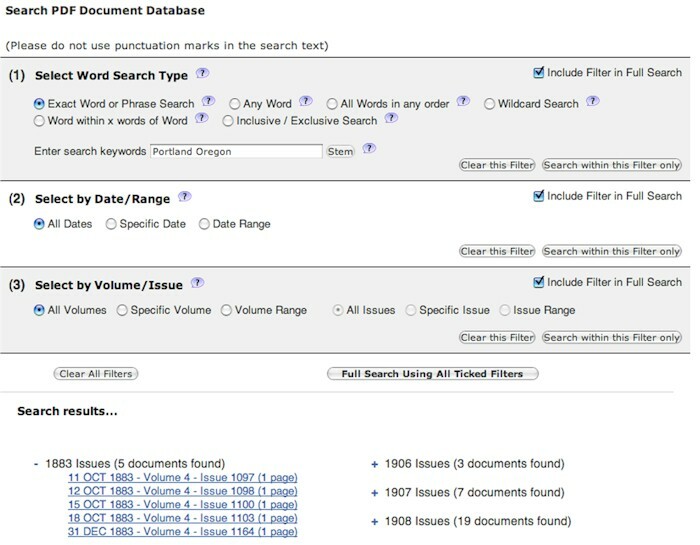 Figure 2 shows the one for “Exact Word or Phrase Search Help.” I’m showing this search for the exact phrase “Portland Oregon.” I omit the comma because programming issues will not allow a search with punctuation. 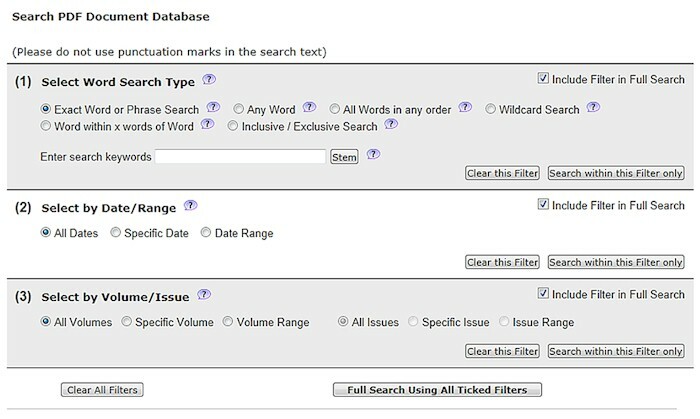 (b) The default radio button for the second filter is “All Dates.” For the third filter it is “All volumes/Issues.” This full search (actually accomplished by now clicking the “Full Search Using all Ticked Filters”) will usually give you too many individual issues (as PDFs) that contain your desired text. Figure 3 illustrates part of the results of the search (eg, + 1883 Issues (5 documents found etc.)). (c) Next click on the + sign. This causes the results in Figure 4 where all 5 documents (issues) found are shown. (d) Finally click on, say, the first issue. A new window will open in your browser and the PDF corresponding to that issue will be displayed with the search word or phrase highlighted (Figure 5 shows part of the resulting new window). You may then read, print or download the PDF. Again, this search gave you a lot of information, perhaps way too much. (5) So how do you limit your search so that your results are a manageable number? First, again, in the first filter choose the text and search function you desire. Then use the second and third filters to delimit your search by either using the second filter to limit the date range or third filter to limit the number of volumes or years or issues that are searched. Now, as you did in the unlimited search, actually perform the limited search by clicking the “Full Search Using all Ticked Filters” button. Note that the results, shown in Figure 6, where the date range was limited, are much more manageable. (6) What happens if I choose a search function in the first section/filter and click on that filter’s “Search Within This Filter Only”? Such searches will include all dates, no matter which radio buttons are ticked in the second and third filters. I hope that this introduction to the digitized Postal Bulletin web site has both whet your appetites to use the site, and at least introduced you to techniques for making the site as useful as possible for all of you. Postal Bulletin © 1971 - 1994 and 1995 to 2014, United States Postal Service. All Rights Reserved. Used with Permission. The United States Offical Postal Guide, 1874-1954, is used under license and with permission from the United States Postal Service. All rights reserved. US Postal Bulletins Consortium 2014 .